Pavelec signed a 5-year deal worth $3.9 annually. As TSN 1290's Hustler & Lawless interviewed Winnipeg Jets GM Kevin Cheveldayoff Monday afternoon mere hours after signing the Jets undisputed number one goalie in Ondrej Pavelec, there was a sense that maybe the Jets have something really good going on here in Winnipeg. For the Jets, who were seemingly deep in a hole after Pavelec was offered a one-year contract to play in the Kontinental Hockey League at a price tag north of $5 million, they have seemed to rebounded in good timing and locked up their budding goalie. But once the deal was reportedly off the table from the KHL, it was apparent that both Pavelec and agent Allen Walsh had lost a bargaining chip to help them get a contract with larger dolllar figures. However, it is Pavelec's reaction to signing the five-year deal that is interesting and very hopeful for both Jets brass and fans. "That's all I was looking for, to stay in a city you like." 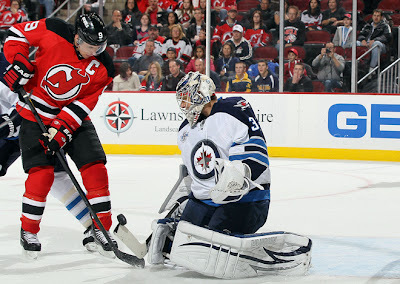 Coming off a career season, in which he posted a career high in wins with 29, the Jets not only got a slight pay raise at $3.9 million annually, but is looking to ramp up his play and improve his less than stellar 2.91 goals against average and .906 save percentage. 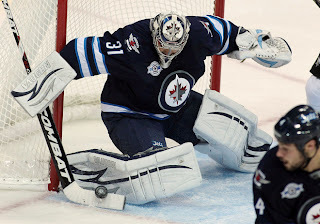 But Pavelec's decision to stick in Winnipeg as the number one goalie must prove a significant point that the Jets seem to be going about matters and dealings with their players in a professional and caring way. During the days of True North's ownership of the Manitoba Moose, there were certain core players that seemed to stick around year to year, including Jason Jaffray, Mike Keane, Nolan Baumgartner, and now a member of the Jets player development squad Jimmy Roy. It's no secret that True North, including Mark Chipman, Craig Heisinger, and Kevin Cheveldayoff, continue to breed a culture that makes their players, whether top or bottom of the barrel, welcome in Winnipeg infused with a want to play here. Pavelec's signing cements the idea that he wants to play in Winnipeg. Ondrej Pavelec posted a 29-28-9 record in 2011-12. He did not file for arbitration nor outright refuse the contract. Pavelec wanted to play in Winnipeg and made sure it got done sooner rather than later. As a core player, his signing is significant because of the other qualifying offers Cheveldayoff has handed out. As was with Andrew Ladd last summer and now Jim Slater and Ondrej Pavelec this summer, Jets fans and pundits alike will not have to wait long for additional signings to come around, including another core player in Evander Kane. One thing is for sure, if he signs, see that he will say he wants to stay in Winnipeg.